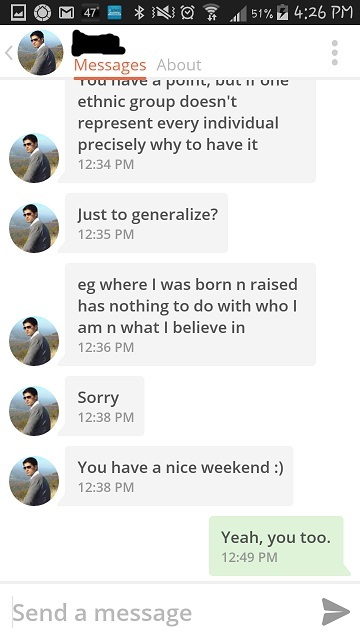 Adventures in Dating: First impressions are everything. For this blog post, you'll need no introduction or background other than this snapshot. Needless to say, I never responded. 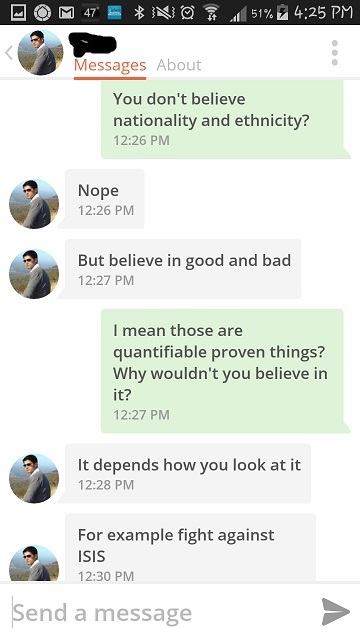 Adventures in Dating: The smart dumb one. It's been a while since I spoke with this specific guy, but I remember him saying something being very scientific and working somewhere seemingly important hence the 'smart' and I'm probably misremembering because, well you'll see. The 'dumb' comes in because he doesn't believe in nationality and ethnicity and thinks that the key to fighting ISIS/ISIL is to not believe in divisive factors. I get that part. I get saying that these factors should not be divisive and that you want the world to be whole and peaceful. The dumb part is not acknowledging that they exist at all. Nationality? It exists. 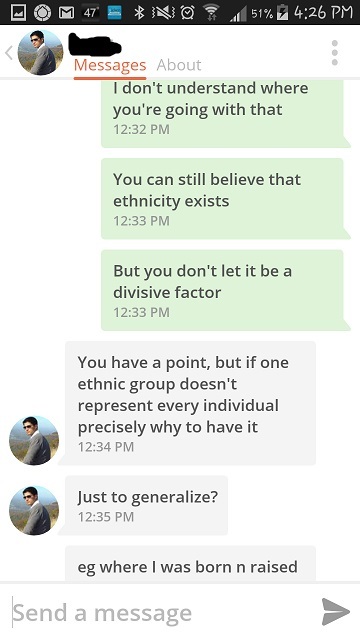 Ethnicity? It exists! Ever hear of passports and different physical features because of different ethnicities? Like straight hair vs curly hair or big eyes vs small eyes or dark skin vs fair skin? I'm not imagining it when I look at me and my friends and see different physical features. We acknowledge it exists and we don't let it divide us. In fact, we revel in being different. So, to the smart dumb one from Tinder - the fact is, these ideas actually exist and you denying they exist doesn't make it so and isn't the best way to be the change you want to see in the world. Note: I lost a screen somewhere so the first part of this conversation is us talking about breakfast. He had 'green juice' and I said "what happened to good ole fashioned bacon and eggs?" which offended him a bit because he's a vegetarian. 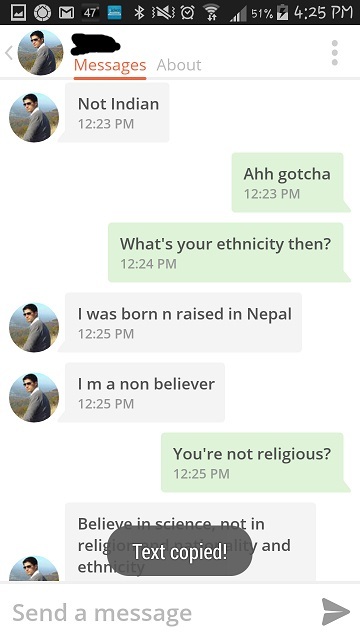 Then I tried to change subjects by asking his nationality, which seemed to offend him even more because I automatically guessed Indian. Note to self: no more guessing. I personally love when people try to figure out where I am from, but I guess I'm more of a free spirit and I don't get offended very easily. Unless people tell me to 'calm down' or 'relax'. Then I get all...Dwight.